The philosophy of controlling your total station with the aid of a handheld electronic computer is quite simple. 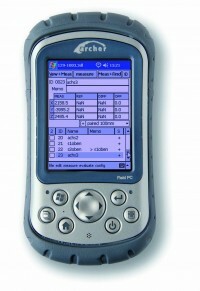 The software of the handheld PC carried out all data processing. 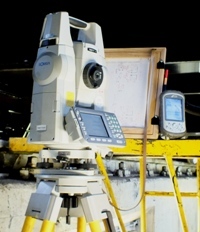 The total station measures “only” two angles and a distance. Standard data is transferred to the field electronically via Bluetooth or cable immediately after being logged. Calculations such as orthogonal coordinates (Y-X-Z), the correction values at stakeout, or the position of the freely selectable point are assumed by the field computer. The user is able (with Bluetooth interface) to stand next to the object to be measured and/or staked. This eliminates the “Chinese whispers” when transmitting the prism height, the point code, and/or the point number. The provided software is very easy to learn. Due to its ease of use, you are familiar with the software after only half a day or one day of training. Old or outdated total stations or tachymeters such as the SET6 or SET500R are usually in technically perfect condition. Only the data logging function (e.g., plausibility check of the measurement results through graphical user interface) and data processing capabilities (e.g., import and export of various data formats) are no longer appropriate or convenient. GLM Lasermeßtechnik offers you, depending on the range of tasks to be carried out, various ways to solve this problem. Use electronic handheld computers with corresponding software. In the 90s of the last century, the SDR4, SDR4E, SDR31, and SDR33 field computers were often used. Since there are no spare parts available any longer for this type of equipment and the SDR software is now also pushed to its limits, we recommend that you convert to updated equipment in timely manner. Do you have any questions or want additional information or a quote? Simply call or send us an e-mail. We gladly assist you.